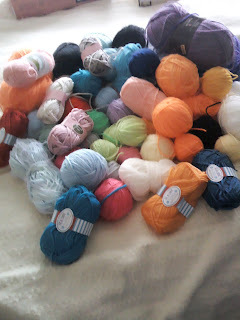 As with all knitters I have stash that needs using up all those odd amounts that will not make a project and those odd balls of yarn that were bought or given to you that you have no idea how to use. So I have stash that needs using up and have decided to join two challenges. One is on Sparkpeople in the Knit it up Team. They have a challenge for July we count the yardage we knit and do exercises during the week as well. I am altering it so I can knit it in panels rather than one large piece. The reason is simple I can use up all the odd amounts of yarn I have if I make it in panels plus it will be easier to handle and I can knit it anywhere. I can do this between making more baby blankets for the hospital that way I don't get fed up doing the same thing. It is just for fun so why not join in and use up some of that stash you will be amazed at what you can make out of it.